The Carolina Amusement Park was located in Gastonia, NC (east of Charlotte). As you can imagine, researching for the terms Carolina mixed with amusement park will bring lots of interesting results. As of the date of publication (8/15/2017), I was only able to find two years worth of advertisements for the amusement park, covering 1957 and 1958. The Gastonia Gazette, Friday, April 19, 1957. Page 9. HEY, KIDS…Carolina Amusement Park, corner Linwood Road and U.S. 74. Gastonia-Kings Mt. Highway, opens tomorrow…FREE ACTS—PRIZES. Entertainment for the whole family. Music—Dance Pavilion—Concessions—All Kinds of Rides—Games. EXTRA SPECIAL—Saturday and Sunday…See Charlie, The Wrestling Baboon and the Ventriloquist. 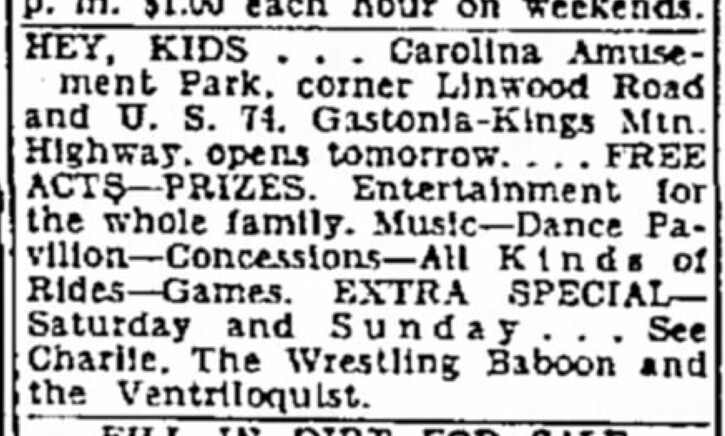 This advertisement appeared in the classified section of the Gastonia Gazette for the grand opening of the park on Saturday, April 20, 1957. Surprisingly, there were no interviews or articles in the local paper or any other news items about the opening. Gastonia Gazette, Saturday, April 20, 1957. Page 18. Charlie takes on three junior contestants at one time. Throw Charlie and win a valuable prize! Charlie is the world’s only wrestling’ baboon! Two days only, Saturday and Sunday. Five performances each day. It’s noted that the park is open at 1 P.M. daily and Sunday. This advertisement was taken from the middle of the comic pages of the newspaper. A fairly generic line drawing of a fair is presented. Gastonia Gazette, Wednesday, July 3, 1957. Page 4. 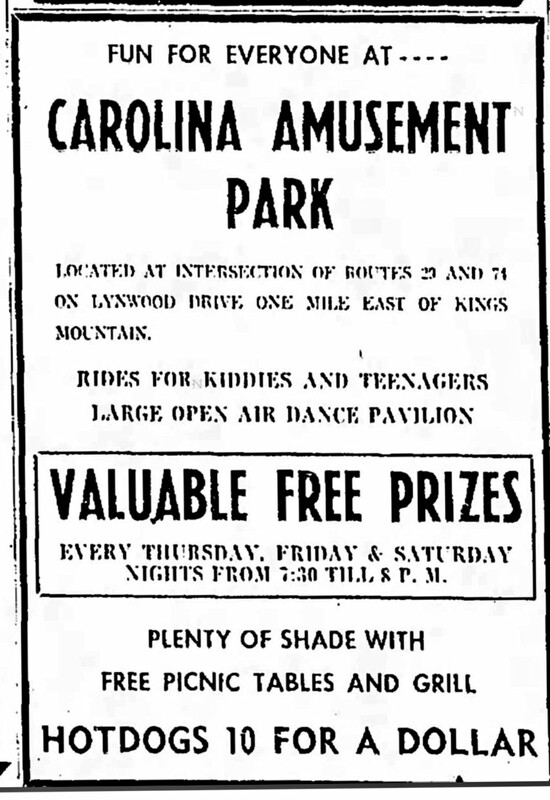 The advertisement focusing on the July 4 celebration at Carolina Amusement Park offers more information about the park. It lists the following features: boat ride; concession stand; live pony ride; merry-go-round; kiddie train; rock & roll swing; auto ride; free prizes daily; and Hazel “The Gator”. You can also clip the coupon for a free ride on the merry-go-round at any time. The park is listed as being open from 1:00 P.M. until midnight (seven days a week). There are also special rates for birthday parties, church or civic groups. The next advertisement appeared in the Gastonia Gazette on Friday, May 30, 1958, page 9. It was another ad in the classified section. This time, the ad listed: rides for kiddies and teenagers; concessions and games; plenty of shade with free picnic tables and grill. Again, the park was open at 1 P.M. daily. This rather sedate but large ad featured in June of 1958 mentions the open-air dance pavilion and the fact that you could buy 10 hot dogs for one dollar! I’m not sure if those were cooked hot dogs or that you could grill them yourself. I’m assuming it was a last-ditch effort to get people to come to the park. WANTED – TO BOOK ON PERCENTAGE. Ferris wheel and any other major rides for Park located on U.S. 74 and 29 near Gastonia, N.C. Ned McGill, Carolina Amusement Park, 509 N Ramson St., Gastonia, North Carolina. Billboard was the trade publication that focused on circuses, fairs and traveling exhibits in the early part of the 20th century before morphing into a trade publication for the music industry. Ned Alexander McGill was born September 9, 1921 and died November 2, 1984. Based on digital city directories, during that time period, he listed his occupation as a salesman. Was he a salesman for the Carolina Amusement Park or the owner? Carolina Amusement Park: Closed in 1958? FOR SALE – FIFTY-FOOT TWO-ABREAST Parker Merry-Go-Round, gasoline powered, all gears and sweeps perfect: good top, needs 12 horses; $1,150 cash. Ned McGill, 509 North Ransom, Gastonia, N.C.
With the lack of articles for the park after 1958, I assume that it folded in the fall of 1958. Potentially, it could have held on for another season, but there is no mention of it. With the attempt to sell the merry-go-round and the fact that it needed 12 horses leads me to assume that Carolina Amusement Park probably did close in 1958. Did Ned sell off some of the horses? Were they damaged? As I mentioned earlier, doing a search for “Carolina Amusement Park” in most online databases yields varied results, mostly articles on Carowinds or my NC Amusement Parks page on this site. Do you have any information or photos about the Carolina Amusement Park located in Gastonia? Most of the articles used in this post came from the Gastonia Gazette newspaper (as of 08/15/2017). This article is part of an ongoing series detailing the history of amusement parks in North Carolina. Dates and information on the page may change due to new information being discovered. At its most basic level, I’m considering an amusement park to have at least one motorized ride (electrical, steam, gas-powered, etc. ).